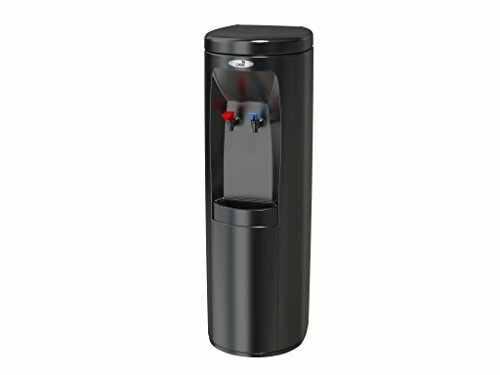 Magic Mountain's Bottleless Water Cooler Dispenser (Hot And Cold Black, Dispenser Only) by Atlantis at Friv 4 Friv . Hurry! Limited time offer. Offer valid only while supplies last. Cabinet: Polythelene cabinet with predrilled holes for simple cup dispenser installation. Cold Water Refrigeration Unit: Convection cooled condenser. Cabinet: Polythelene cabinet with predrilled holes for simple cup dispenser installation. Cold Water Refrigeration Unit: Convection cooled condenser. Internal, spring mounted, hermetically sealed compressor with automatic overload protector requires no lubrication. Refrigerant is controlled by a capillary tube. Cold Water Thermostat: Temperature is controlled by an adjustable thermostat and easily accessible on the rear of the unit. Cold Water Reservoir: Durable heavy-duty type 300 series stainless steel with external copper refrigerant coil encased in pre-fitted molded plastic foam insulation. Two-Piece Hot Tank Water: 500-watt heating element is easy to service. Hot tank is a type 300 series stainless steel and can be easily opened for cleaning and removal of mineral deposits. Individual components can be replaced when needed, minimizing the need to replace the entire hot tank. Hot Water Capacity: 45 x 6 oz. cups of piping hot water per hour. 1.5-quart storage tank. Hot Water Thermostat: Fixed thermostat with safety limiter. Hot Water Safety Faucet: Self-closing activation requires a two-step action that's easy for adults to use but protects small children. Float system: Dual mechanical floats include a safety lock Drip receptor: Durable dishwasher safe drip tray lifts out for easy cleaning. Electrical: 115 volts, 60 hertz. 1/20 hp. water cooler compressor. Three wire service cord & polarized plug. Lead-Free: Components in the water cooler are lead-free as defined by the Safe Drinking Water Act Amendments of 1986 and the Lead Contamination Control Act of 1988. Model listed by Underwriter's Laboratories to U.S. and Canadian Standards. Warranty: Limited 3-year warranty (within the Continental Limits of the U.S. and Canada). Three years on the sealed refrigeration system, one year on most component parts. Detailed warranty certificate enclosed with each cooler; sample copy available upon request.Dimensions: W 13" x D 12 13/16" x H 40 1/16"
TAP or CLICK the button under the "Size:" option and a drop-down menu will appear. There are discounted compatible filtration combination bundle packages for your every possible need right there. CLICK ON THEM AND THIS PAGE WILL REPOPULATE WITH THE PICTURES, DESCRIPTIONS, AND PRICES. Excellent source of emergency water supply as the Dual mechanical float system with back-up safety operates to store and protect your water even when the power is out. Model: Hot N' Cold: Dimensions: W 13" x D 12 13/16" x H 40 1/16" Approximate Net Weight: Hot N' Cold (POUD1SHS): 45 lbs.